Sadly, all vacations come to an end. After saying goodbyes to friends with whom I felt closer now, it was time for Denise and I to leave Palm Desert. 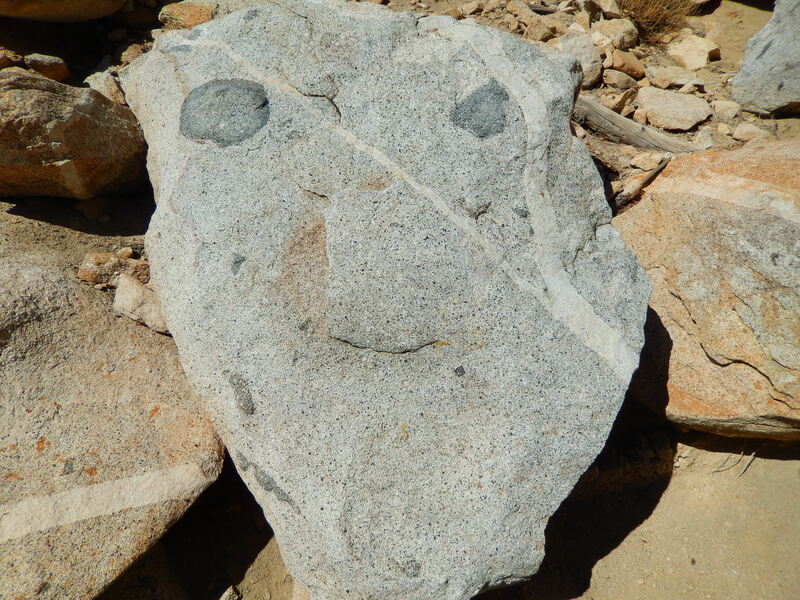 We picked the highway headed through the mountains to Idyllwild, where we would rendezvous with another old friend and former firefighting comrade, Scott. 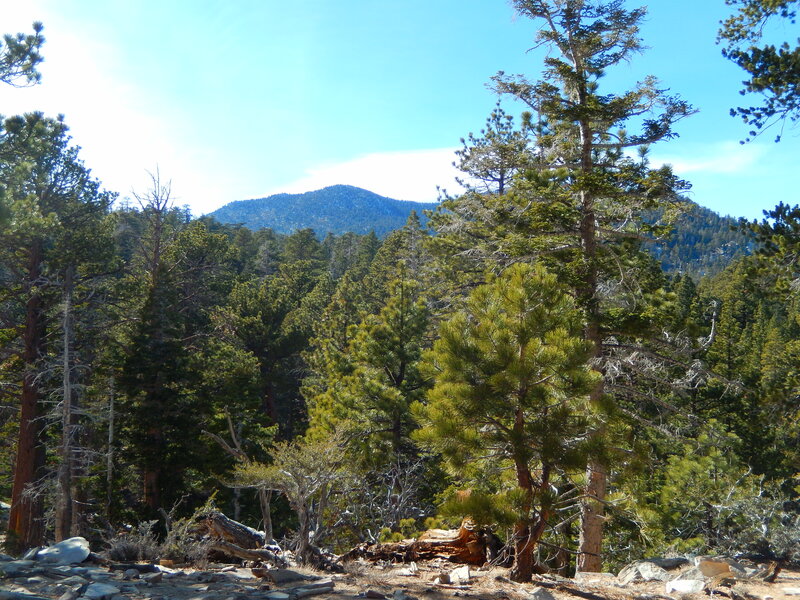 The drive was dramatic in the beginning as we wound through many tight turns to climb out of the desert and move into the cooler pine forests of the San Jacinto Mountains. As it turns out, Idyllwild is a classic cute mountain town filled with log cabins and faux Swiss chalets. We had a great lunch with Scott, who had just officially become a firefighter in Idyllwild. Denise wanted to get some computer work done, so she found a great cafe, while Scott pointed me towards a trailhead before returning to the fire station. I drove uphill and found a trail with little trouble. Unfortunately, once I was up there I realized that I didn’t have the correct parking pass. I just hoped I wouldn’t get a ticket, and I headed up, feeling the elevation as I started up hill. 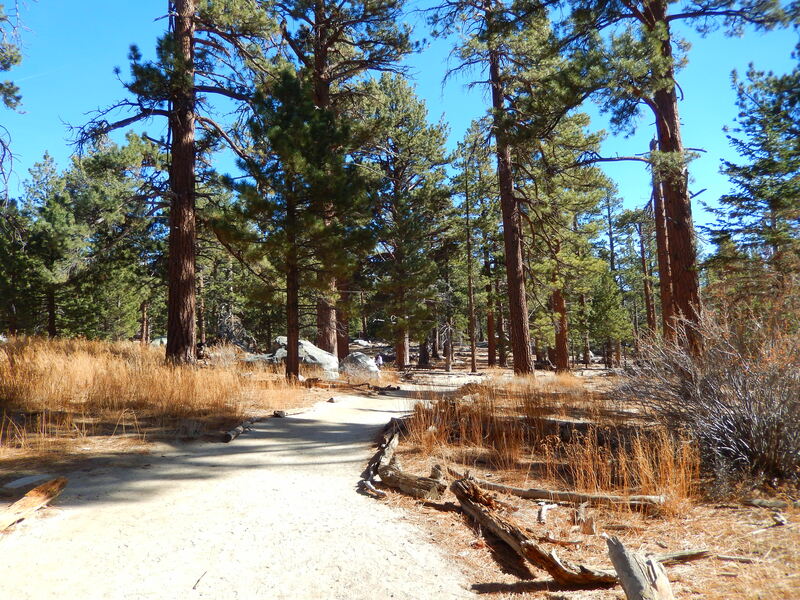 Idyllwild itself is a hair over a mile high, so the trail must have started about 6000 feet. It had been many months since I’d hiked at that altitude. I know it’s not that high in the greater scheme of things, but I was huffing and puffing fairly hard at first. It is as though I need to warm my engine up, and then I can hike all day. As soon as I embarked on the trail, I saw a sign mentioning a wilderness permit. One more omission. On Mount Hood, you can self issue a permit at the trailhead or wilderness boundary, but I found no place to do that. In less than an hour, I met a ranger. Rejected! I needed to go back to the ranger station to get a permit. “This is one of the most heavily traveled forests…” Blah blah blah. I hate bureaucracy, even as I know it may be necessary. Thus I turned around. It was enough. Idyllwild was a cute town. I was disappointed we couldn’t find a room for the night. It was a holiday weekend, so vacancies were rare. Onward. I pointed straight for Ontario, where it was still challenging finding a room. Vacation was effectively over, but it had been a good one. The Palm Springs aerial tramway is reminiscent of the tram I rode outside Albuquerque, New Mexico last summer. Both gain a lot of elevation in a hurry, transporting passengers from the desert to a subalpine ecosystem. 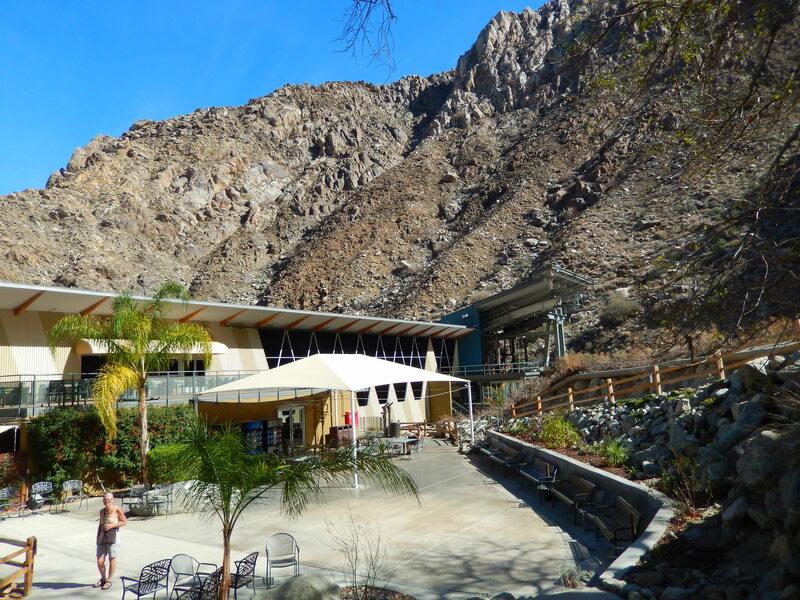 The Palm Springs tram wins the innovation contest, because its cab spins two complete revolutions during the ten minute trip up Chino Canyon. Thus each passenger can effectively see in all directions. At the upper end of the tram, there is a lodge with a restaurant and bar, a mini movie theatre, viewing decks, and access to wilderness trails. We soon had a group of folks traipsing around the mountainside on a loop trail. Interpretive signs dotted the path. 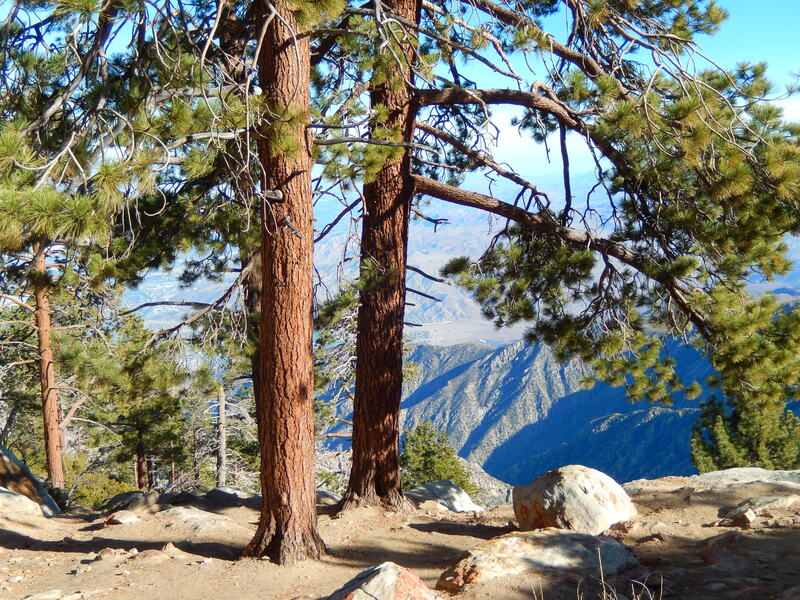 I learned that the bark of a Jeffrey Pine smells like vanilla (some people say butterscotch). Who knew? Our path led us from a pleasant meadow through pine forests forest to cliff’s edge on five occasions. The views ranged from great to spectacular. 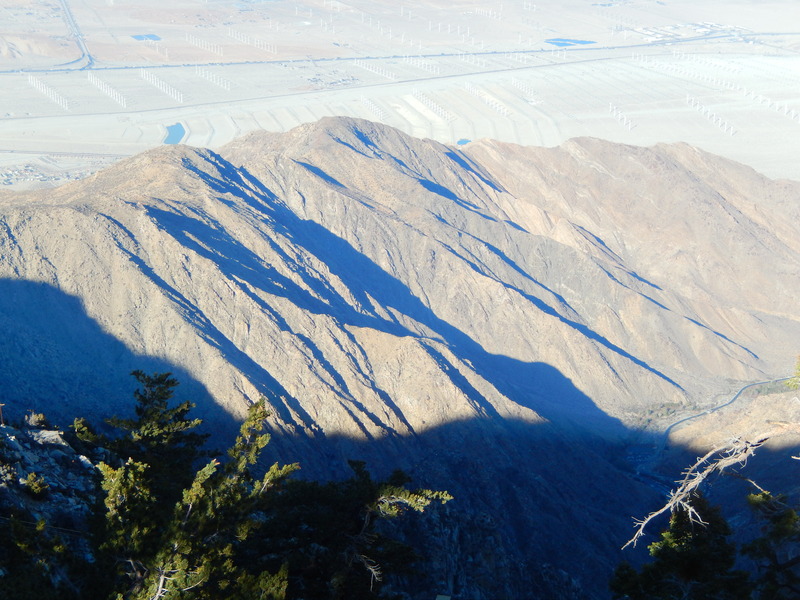 Ridges and canyons plunged more than a mile to the vast desert plains where across the Coachella Valley we could see the Salton Sea. I felt at home in the mountain environment, and I could have stayed there for days, hiking off into the wilderness and peakbagging in perfect weather. 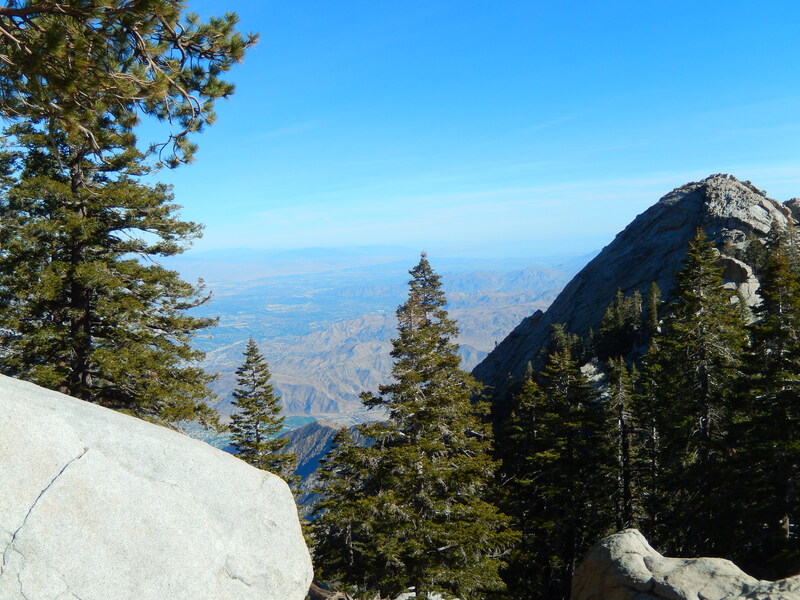 Mount San Jacinto, one of the tallest peaks in Southern California, is nearby. The only concern is water. Signs on the highway below don’t tell drivers to be safe. They tell drivers to conserve water. I can’t help but wonder what will happen for Southern California residents if the drought continues. Our loop skirted the edge of the massive escarpment looking down onto the desert. I loved popping up to various viewpoints amid the rocks with slightly different views of desert, crags, and canyons. It was also interesting to see the streets and land plot geometry of the dry cities in the brown world below. Our group met back at the lodge on top of the tram for round of Bloody Marys. Not bad at all. 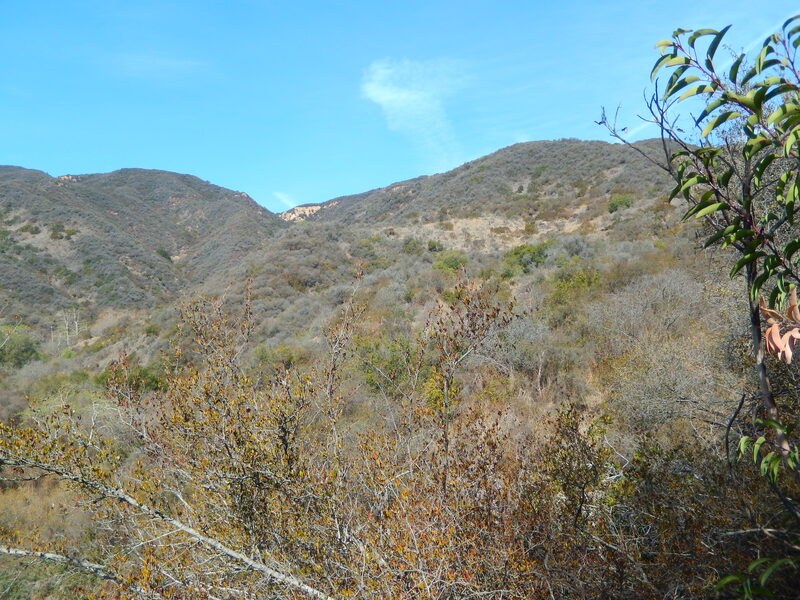 Visiting relatives in the San Fernando Valley, and still relishing a change of weather, I craved hiking some of the many hills in the vicinity. 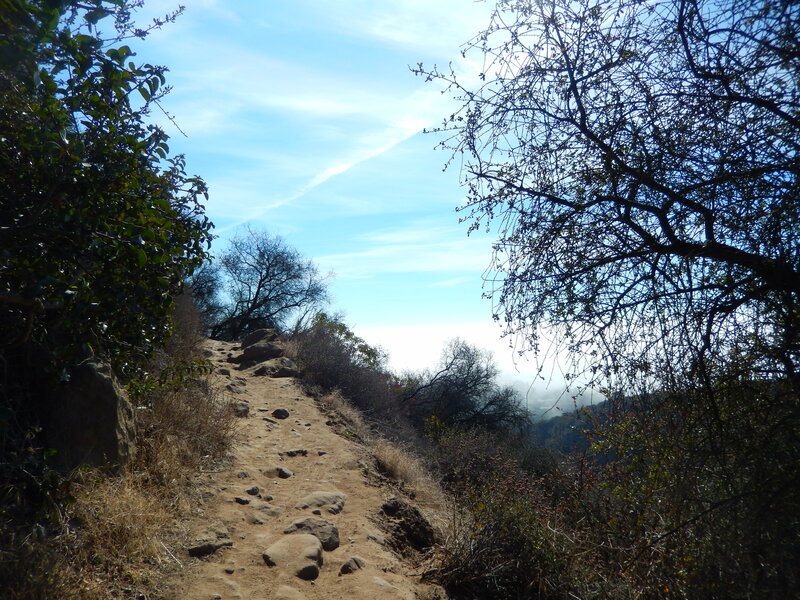 Lucky, my sister-in-law was happy to lead us to a place near Topanga Canyon called Los Leones Canyon. The scrubby hills are a world apart from green western Oregon. The trail had a couple steep pitches, but it was mostly easy. We passed fifteen or twenty people along the way. After a mile and a half, we reached a broad viewpoint that took in Pacific Palisades and the many rugged hills in the vicinity. A bench there beckons hikers to rest. We enjoyed the sunny views for a few minutes before descending. 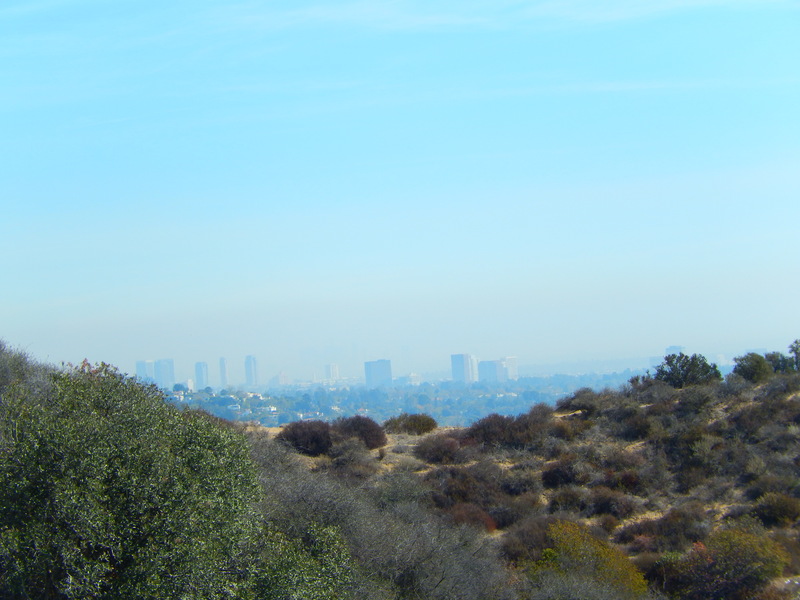 We could even see downtown L.A. It was pretty darn nice. One thing we didn’t see was the ocean, which was fog bound. We joked about the ocean being comprised of clouds, and I thought that would make the setting of a nice little fantasy story. Hmm. 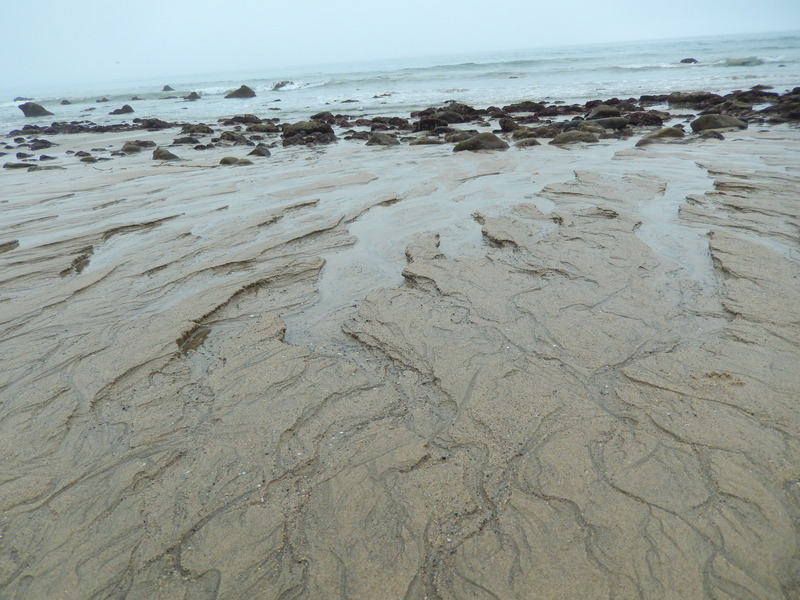 Afterwards, we stopped along the beach, which was a nice counterpoint to the sunny hills. It was only a mile and a half by road from the trailhead, but it felt like another world. No sun in sight, just fog and wind! 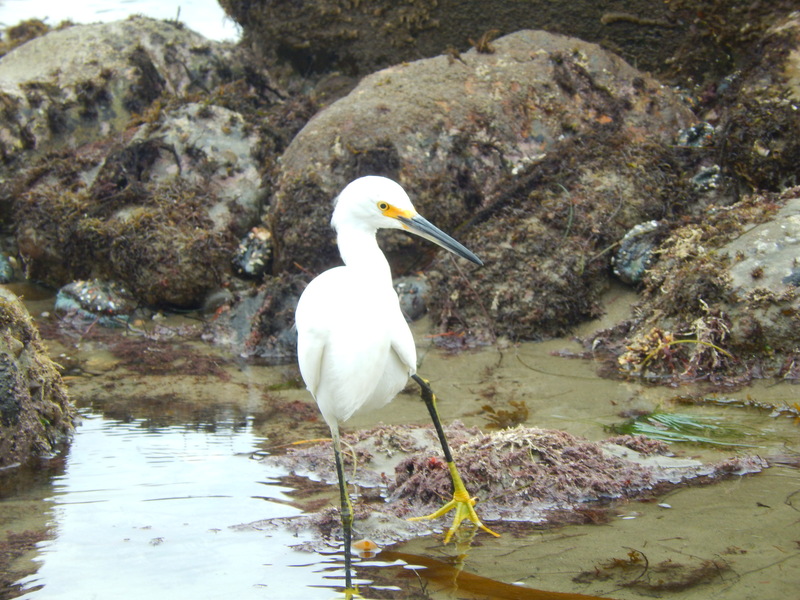 I spied a gorgeous and fearless bird that seems similar to a snowy egret, but such a species seemed out of place on a beach. Regardless, the excursion was great success, and we stopped for cold drinks in Topanga Canyon on the way home. Is it a snowy egret or something else?